Every culture over every time period has stories of the spirits that roam the earth. This constant in human civilization leaves no room for doubt on the presence of spirits of the dead coming back to the human plane as an ethereal existence. According to all the stories, folklore, and witness testimonies, the world is full of spirits. Their method of interacting with the human world differs from spirit to spirit as well as their intentions though. Some are evil. Some are benign. Some are indifferent. However, the manifestation of a spirit who wishes to do harm to the living or is intentionally being a bother to living humans does happen from time to time. At the worst it can lead to outrageous fear and trouble and at the least annoyance to the humans the spirit chooses to haunt. Here is a list on how to get rid of any pesky spirits that you wish would leave you alone. The idea of using blessed water, whether by a Catholic priest or merely the head of a Wiccan cover, is a very old belief. Water is thought to be one of the neutral elements which can act as a transitory plane or a barrier. Its ability to cleanse and wash off anything that sullies the body in addition to its necessity for all living creatures makes most cultures believe in the sacredness of water in general. If you add the consecrated quality that is innate to water to a divine blessing of sorts, no matter what religion you prefer, you will create a naturally powerful element which will protect you against all types of evil spirits. Once you have your water blessed by the religious official of your choice, merely wet your fingers with the water then spread it across the top part of all the thresholds of the haunted room—doorways and windows. The barrier created by the blessed water should keep out the evil spirits at each of the room's entryways. The idea of a banishing ritual is seen throughout history and across the globe. Any culture that has a strong belief in malicious spirits and their ability to interact and affect the living has a type of banishing ritual. However, modern Western culture has designated most banishing rituals as a pagan custom. Spells that banish can vary greatly even from person to person. Yet, they can be relatively simple. The easiest way is to write down the problem on a piece of paper, being as concise and specific as possible. 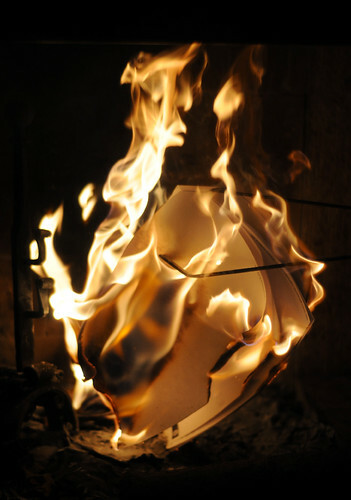 After focusing deeply on the problem written on the paper, you must burn it. Most people prefer to burn using a white candle or by lighting the paper and placing it in a white bowl to allow it to burn in a controlled setting. The mystical use of herbs in certain settings and for certain reasons has been used for centuries. During the Elizabethan era of Tudor England, it was common place to use herbs rather than flowers during ceremonies such as weddings, funerals, or elevations of status to bless the special occasion. However, the meanings and specialized uses for particular herbs varies over the entire world and over time. To suggest for helpful herbs though, here are some useful herbs from different cultures from history to try out on your malevolent ghost. Even though most people think garlic is merely for vampires, it is actually a protective herb for all evil spirits. All you need is a single clove (not a giant bulb) placed at points of entry that need protection, doorways as well as windows. If you are the particular subject of the spirit's actions instead of just the room, feel free to keep a clove in your pocket. A bag of protection can also be made from herbs that will be helpful. A small amount of cinnamon, five-finger grass, ague weed, and sage in a pouch that you place at thresholds or carry with you will most certainly protect from evil spirits. Sage in general is renowned for its ability to cleanse any malicious presences. Merely burning sage in a doorway and windows of the haunted room are thought to provide a very strong barrier for particular evil spirits while allowing good spirits to pass. Many people feel that spirits, particularly evil spirits, must perform certain tasks when they are faced with them. One of these tasks to be performed by ghosts is the activity of counting individual grains. The type of grains—seeds, sand, beans, or rice—are generally not what is important. The number of the multiple particles is what you really want to bring attention to. It is said that the spirit is forced to pause and count the grains of the spilled substance. Having a great many of them in one space and the inability to pick them up as they go, the spirit gets frustrated with having to start over and over again and will soon give up and leave your house all together to haunt someone who does not require them to count meaningless molecules. Merely spill the grains of your choice in the haunted room every night and clean up in the morning. Tales indicate it should take less than a week to get rid of a spirit this way. If you don't like the idea of having to clean every morning though, keeping the grains in a clear vial or tube that you hang in a doorway or window is thought to be just as useful. Salt is very prevalent in folk remedies. It is thought to have the same purifying and cleansing properties as water. Just like water, some people prefer to have it blessed before they use it. Once blessed, or even not, make a line of the salt at the threshold of your door and windows. The salt on the floor or ledge of these entryways will keep any spirit from entering your room. If you perform this act at entries of the entire house, the whole residence is assumed to be protected from entering spirits—whether they are vindictive or neutral. Sea salt is the favored type even though table salt can work on its own. Since the majority of spirits that haunt the realm of the living used to be humans themselves, they are probably haunting for a reason. While it may seem silly, acting as a type of counselor to this evil spirit can put the ghost at ease and allow them to pass on to another plane of existence or at least to a state of peaceful being so that they do not wish to bother the living anymore. This can be achieved several ways. Straight forward meditation then asking your questions allowed is the simplest way to speak to a spirit. If you use this method, you'll probably want to stick to “yes” or “no” questions so that the spirit can answer easily. Ouija boards can be used to talk to the spirit as long as you specific that you are requesting the spirit who is haunting you. You must specify you are asking for the bothersome spirit or you may end up solving a problem for the wrong spirit or calling an additional bad spirit into your home. Ouija boards must be used with care.